This website is a resource for teachers and tutors teaching ESL to adults. All content is written by an ESL teacher currently teaching English as a Second Language. It's intended to help teachers—especially new teachers—save time and resources by providing essential English-teaching information in one place. When I first started teaching English to adults, I spent a lot of time preparing ESL lesson plans; and I mean a lot of time. Because I'm a native English speaker, I'd never had to think about English grammar, idioms, phrasal verbs, time markers, past tense pronunciation, intonation, verb tenses and all the other things that make up the English language. I just automatically used them. I've been using them for decades! So when I studied for my TESOL certification, I had to start thinking about all of these English language components. I especially had to think about how to teach them to English language learners. At the beginning of my ESL teaching career, much of the time I spent preparing lesson plans was making sure that I thoroughly understood the English language concept I was going to teach. I studied numerous ESL grammar books and scoured the internet looking for help to understand the topics well enough to be able to effectively teach them. This site is a compilation of the many English language components that I had to learn well enough to teach. Hopefully, it will save other teachers and tutors who are teaching ESL to adults a lot of time (after all, most of us aren't paid for all the time we spend preparing lesson plans!). Every class is an opportunity to help and to teach, but it's also an opportunity to learn and to receive. If you're thinking about getting into this profession, I've also provided information about how to start teaching ESL to adults. 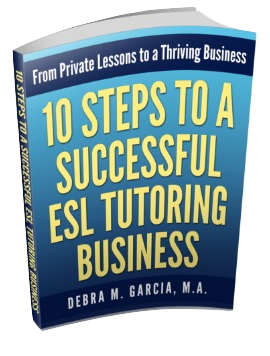 And if you're thinking about doing private tutoring, then I strongly encourage you to check out my book, "10 Steps to a Successful ESL Tutoring Business." I hope you will enjoy this career as much as I do! What's in this English Teaching Site? Check out the Sitemap to see a complete list of the pages in my site. You can also find specific words or phrases quickly by using the Google search box below to find ESL and EFL info.